He didn't look nervous. There was a certain untouchable calm on his face that didn't match my own trembling self. My mom invited them inside the house, had them seated, he and his mom. I peeked though the little opening in the kitchen outwards to the hall. I wondered why his calmness should surprise me. Hasn't he always been that way - calm, composed and confident. Momentarily my eyes drifted from his face to the freshly fried samosa, that were being picked out of the kadai (wok) by my sister, arranged religiously onto the platter, neatly aligned, triangular crisp garam masala scented pastry. Should I eat one? I contemplated and decided against it. The flaky pastry might get stuck in my teeth I feared. My younger sister, went looking in the pantry for vintage tea saucers, that only came out for special guests. Oddly, the golden rim and dainty floral design with blushing rose pink roses matched my own dress. The setting was a bit too perfect. A tray busting with samosas and a pot full of perfect gingery chai was placed in my hands while my sister puffed one last brush of rosy blush on my cheeks. As I walked through the narrow passage leading to the hall I could hear them talking about the bus trip, the rocky roads and unbearable summer heat of Rajasthan. Despite the air conditioning, the heat was suddenly more obvious in my sweaty palms, or was it mere imagination, I can't recall. But I turned around and went back into the kitchen, opened the fridge with a large spoon in my hand and had many spoonfuls of ras malai which was supposed to be offered later, if we progressed to the talks of engagement. Though it sounded like a typical Indian arrange marriage set up, we had known each other for little while and romantically known from the day we met that we were meant to be. Today was an official 'meet my parents' day. Things went rather smooth from that moment of 'oh should I eat this' to the wedding. Since then, M has never been invited to my parents house without a generously piled plate of samosas and bowlfuls of ras malai. After all, it is where it all began. 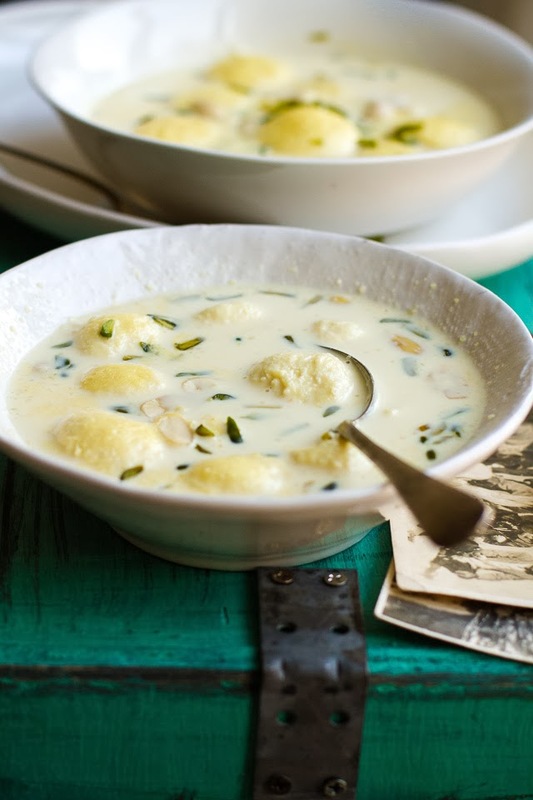 Ras Malai or Rosh Malai as the Bengali's like to call it is a popular North-Eastern Indian dessert. Traditionally, freshly made cottage cheese is shaped into dumplings and soaked in sweetened milk. Here, I have used the non traditional but also a popular milk powder route not only because it's easier but also because that's how my family has always made it. Heat milk with saffron, almond powder and cardamom until it reduces by little less than half. Make sure to stir from time to time to avoid sticking at the bottom. Takes about half an hour. Whisk in the condensed milk and keep on low flame. Meanwhile lightly knead together the milk powder, baking powder, ghee and egg to form a smooth non sticky dough. If the dough is sticky, add 1 tsp of milk powder at a time until smooth, crack free dough is achieved. Divide the dough into 16-18 equal size balls and lightly flatten them. Keeping the milk at medium high heat, with a spoon add all the balls into the milk and heat for 3 minutes. Cover and continue to cook for another 5 minutes. The dumplings will rise to the surface, double in size and should be soft all the way through. Chill for couple of hours before serving. To avoid the thin layer of skin to form on the top, cover the bowl with cling film touching the surface. I don't bother with it. Kulsum - wow! This is amazing. I am in love with Indian desserts (I grew up eating them all the time, as my nanny/second mom was from Kolkata and an amazing cook - she taught me everything I know and love about Indian food). I've never made anything like this at home, but you make it look so accessible and I'm excited to give it a go. Lovely story and lovely dessert. 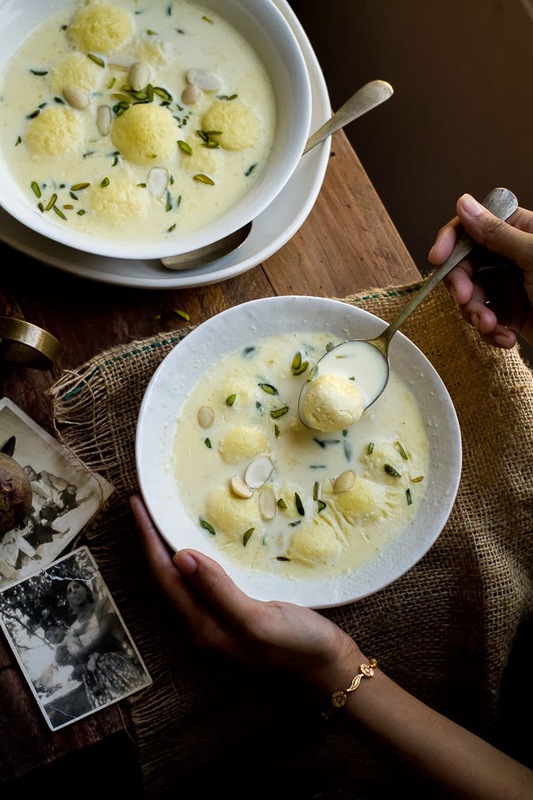 This is a very different version of the Ras Malai I grew up with Kulsum! I never heard of egg being added to it. And it is not really paneer, right? More like the initial stages of a quick gulab jamun with eggs, but not fried? Very interesting to know there are other versions of this. Kulsum, is this a very different version as Soma said ? Eggs was never one of the ingredients to make the dumplings in any rasmalai or milk based Indian dessert I have grown up with.As far as I know, it is made of just pure homemade paneer or chhana as we call it. Breathtaking pics.. but the inclusion of eggs baffles me . WHy? The classic time tested recipe works perfectly without ever having any. Is this a variant of the classic bengali confection from a different region of India? ooh! this is a very different way of making the balls! I only knew of the one where paneer is steamed and then simmered in the reduced milk. This sounds way easier! A delightful dessert! That is something I'd really love to try. This is so unique (to me seeing that it's super popular elsewhere) and I absolutely love it! I can't wait to try! You know kulsum my MIL makes this recipe... very similar. I was too surprised when she added egg but that gave this that much needed sponge... she adds 2 eggwhite n 1egg yolk. Your pics... im in LOVE! !!! BEAUTIFUL! What an unusual recipe for rasagulla! Makes me very curious to try it. Does it taste the same as the chenna based ones? Bookmarking it right now in my ever growing must-make list! Such a sweet story too Kulsum, I remember how nervous I was at the same situation too and my hubs was totally calm, much like how things are even now! 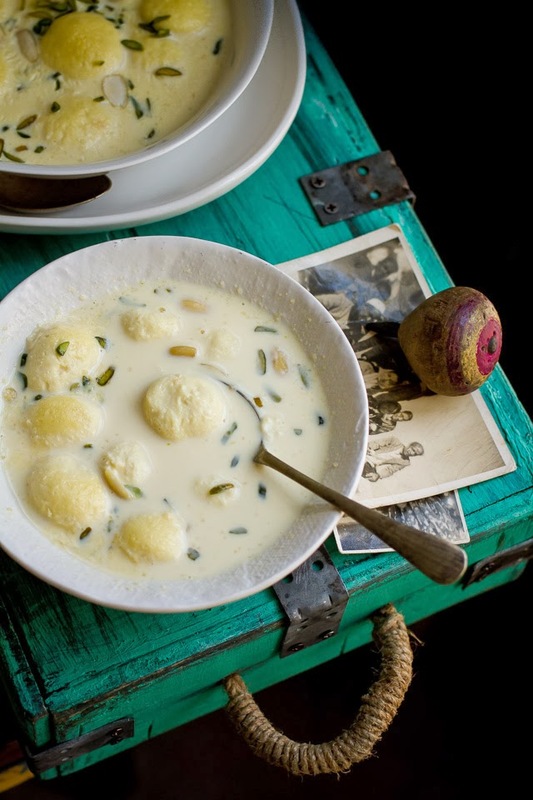 Ras malai is my favorite Indian desserts. Love this one, Kulsum! Never heard about egg in a rosh malai. Interesting. I have made payesh with eggs but never rosh malai. Will try it sometimes. 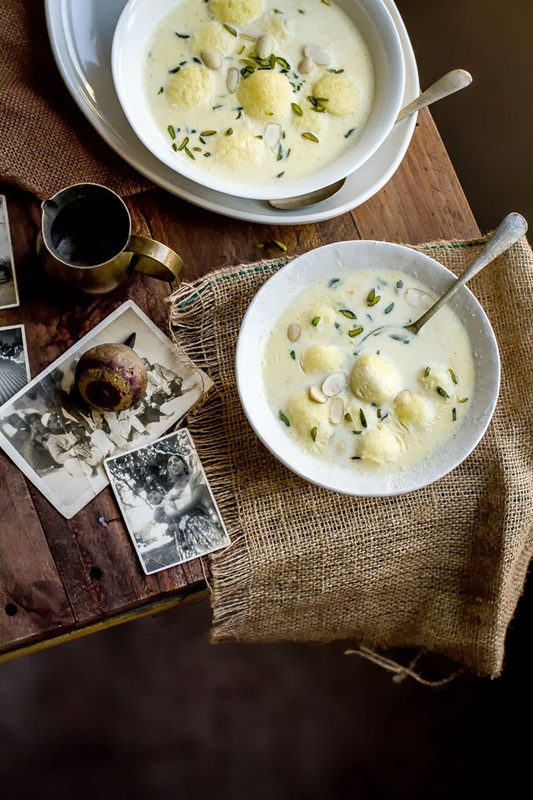 eggs in ras malai is new and interesting, and thanks for offering these new perspectives. love the story too - very cute! A very interesting recipe, never tried egg rasmalai, can't wait to try this version. I love your pics and the way the story builds up :) The first time I'm seeing egg featuring in a rasmalai / rasgulla recipe but it looks simple enough to give it a try. Does the end product have a residual eggy taste? My sister who hates egg never complained about them having any eggy taste so I can confidently say they don't! But I would love to know what you think Nandita! So beautiful and I love ras malai!!! I made this last night and the ras was just beautiful. The almond meal gave it a different dimension but my malai was a HUGEEEE flop. The one egg and ghee did not bind my dough and wasnt sure of what I could use so used a little more egg. The balls floated and expanded but were so dense and tasted of powdered milk. Where did I go wrong??? hi there! So sorry to hear it didn't work out for you. When I say 1 egg I do refer to a large egg and the dough should have started to bind but if at all it doesn't add more ghee not egg. Make sure to cook the balls at a consistent flame to get it to cook all the way to avoid any raw milk powder taste. I hope you give it a second try! Beautiful pictures and a very charming blog you have. I tried this version today and the dough for the dumplings turned out perfect. However when I dropped the balls in milk, at the end of the cook time, they were doubled in size and huge and spongey. When I chilled it in the ref, they deflated on me. Now they are kind of half in size and not hard but just sort of like cake- slightly dense. What could have gone wrong? Hi Ambereen, It could have been over kneading of the dough or over cooking them. Once they have doubled, switch of the flame immediately. I hope that helps. Thank you so much for trying and I hope you give it a try again!